All right, this is a tip I'm a little hesitant to write about since I've tried it all of once so far, but it worked so well this one time I feel it would be a shame to keep it to myself! 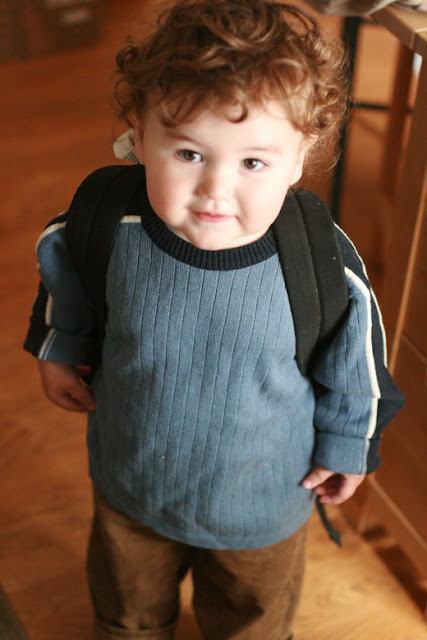 Mikko's been attending a German-immersion preschool for almost a year now. I've always been a little conflicted over our decision to have him go, but as it happens, it's been a really good thing for us to have those two half-days a week for Sam and me to get some toddler-free work time in (today, for instance, Sam is shrink wrapping DVDs with the dangerous heat gun and I am editing Carnival of Natural Parenting posts), and for Mikko to have regular contact with more energetic and creative caregivers and a sweet group of kids. Lately, though, we've been going through a regressive phase of "No Schule, no Schule" (see? — bilingual! Ha!) as a litany throughout the car or bus ride and major waterworks when we pull up to the building. I feel awful. I don't know whether it makes sense to let him stay home for awhile or not. It's not a question of "giving in" vs. "showing him who's boss" (ugh! ), more just that sending him to preschool is a decision that works best for our family as a whole and so it's our long-term goal — in that sense, then, isn't it better to stay consistent and upbeat about school rather than emphasizing his current anxieties by taking a break? With that in mind, we're trying to determine how best to make drop-off less traumatic for us all. I know for a fact, both from discreet spying and from the teachers' reports, that Mikko calms down as soon as Sam or I exit, and when we come to pick him up, he's having a good time and doesn't want to leave. The main teacher's suggestion, and my mom's as well when she was visiting and witnessed the breakdowns, is to drop him off as quickly as possible. Lisa at Edenwild already wrote a perfect post explaining why I don't like the drop-and-run style of leaving my child. It seems disrespectful to him to sneak away and not explain that I'm going and when I'll be back and say a proper goodbye. That said, I do understand the concept of not lingering, something that's very difficult in this particular preschool, since the teacher (the same one telling me to leave quickly) is very chatty (often about what he thinks I should be doing better as a parent, you see!) and I seem to be always stuck trying to talk with him at the same time as I soothe Mikko and get him interested in some toys. Now, when I do make must-leave-now noises, the teacher steps up to hold Mikko and wave goodbye to me and then find a new activity, so I'm pleased with that; I wish the teachers were as sensitive to Mikko and the other kids as Lisa is as a nursery volunteer, but I'm glad at least they've bonded well with Mikko. Still, dropping your child off quickly can't happen unless the teacher cooperates with you! I can't just drop him off crying with no one standing by to calm him. If your child is old enough, have him or her walk into the school. It's so simple, isn't it? Mikko gets clingy when he's feeling threatened, which is understandable, and I automatically was picking him up to cuddle him close as we walked in. But my mom and the teacher pointed out that if he walks by himself, he takes more of a responsibility for entering the school. Then it's not his parent dragging and forcing him into the school — he's now chosen it for himself. I also offered him his backpack to wear, but he chose to have me wear it. Still, I think the general concept is a good idea, particularly for a two-year-old who's asserting his own autonomy anyway. I let him choose which door we went in, and he chose the one (of course) with an elevator just inside. He pushed the buttons on the elevator, and when we get into Schule, he takes his own shoes and jacket off, with some help. I think all of it together helps make him feel more in control. He knows what's happening and when it's happening, because he's performing it himself. So there you have it. I know it won't work with pre-walking kids, but it's worth a shot for the rest! If anyone has any other ideas on how to gently separate from your child, please let me have your tips. We've started our babysitting co-op, so soon Mikko will be exposed to new caregivers and environments, and we'll see how he responds to that! That does sound like a great idea. Lately, my 10 month old has not been happy when I leave for work in the morning, even though she gets to stay with daddy. We figured out that if he picks her up and takes her to another room to play instead of me dropping her off and leaving, she is much happier. I don't have experience yet with with daycare/preschool drop off, so I will be tucking this suggestion away for later use. It's just nice to know how normal this all is. These days my daughter tells me every school morning that she doesn't want to go. No tears or anything, she just objects on principle. And then when I go to pick her up she doesn't want to come home. For her, it's less about school being difficult than transitions. I have no tips to ease separation, because I've never dealt with crying when I left. However, I can say that knowing that it's the TRANSITIONS more than the SEPARATION that's hard for me child has helped me to assuage any guilt I might have felt. She enjoys herself once she's in a situation, she just doesn't always want to move from one place to the next. And who can blame her? I sometimes feel the same way as an adult. What a great idea! I hadn't heard of this one. Will certainly tell my daycare parents as the need arises. Thanks! And thanks for mentioning transitions, Amber! That's definitely a challenging aspect for Mikko, too. Getting dressed, going out, getting into the car, getting out of the car — they all require transitioning, and they all take a loooong time now we have a 2-year-old. I try to avoid scheduling a series of run-in errands when I have him with me for that reason! Molly: Those are great ideas. I'm going to borrow those! :) As for the picture, can you stand the cute?! That was from about a month into his preschool days. I still get sad looking at his first day pics, because I know how overwhelmed he must have been. Olivia: Thanks for mentioning daddy drop-offs. We experiment with trading off who does the drop-off and you're right; I think the tears are less when Sam does it. I as well send my preschooler to a German language Kinderschule. She's 4 now and has been going for almost 2 years and we do not have drop off tears - she loves it! But when she started going she was 2.5 and I just really needed a little time for naps with my newborn. And there were tears. Even though she'd been going to part-time daycare for a year before that. And Frau Dora and Frau Erika at the Kinderschule totally recommended the drop and run technique and would shoot each other these totally German looks everytime my little daughter would cling to my leg sobbing at drop off. But I couldn't just shake her off my leg and run. That's absurd. The Frau's thought it was my fault because "girl sees mother make big deal of it so girl makes big deal of it too." But I so wasn't. It got way worse before it got better where she started throwing these huge scenes that were nearly impossible for me to deal with while holding a newborn in a sling. I once turned around after dragging her sobbing all the way to the door (we were about 20 minutes late by the time we got there) because I was crying by then too (very post-natal) and oh dear... what a mess. What finally worked for us is I walked her through every little micro-step of going to school. First we'll park the stroller under the big tree, then we'll go through the big door and mom will hold it open, and you can walk up the ramp, and then we'll take your coat off and hang it at your hook... etc. etc. I have no idea why that worked with her so well but when I started taking her anxiety seriously instead of thinking it was a big stunt to make my life harder everything resolved with an efficiency and speed that was almost... dare I say... German. Also it totally was about transition anxiety, not seperation anxiety. And that picture? So adorable. Oh the curls. The chubby wubby cheeks. So so cute. That solutions makes perfect sense, considering the situation, because it sounds like he does enjoy school, but maybe he just wanted to be in control. The transitions thing makes sense, too. Maybe transitions are just easier when they get to have some say with them? Oh, and thanks for mentioning my posts! New follower! 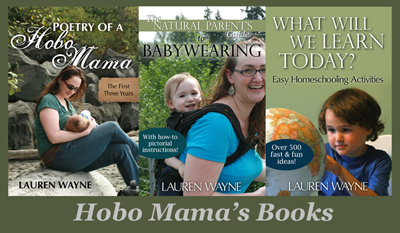 I'm a green mama too and my blog is heavily influenced to help other moms become green too! Dear Hobo Mama. I read this post a while ago, before my son was even attending daycare. I made a mental note and today I tried it out. My son (17 months) cries when I drop him off, although he is happily playing and wants to show me all sorts of things when I pick him up. This morning I gave him on a light little backpack, some shoes he chose out of the drawer and we walked to daycare (it is a 2 min walk from our house - 10 min when you need to stop and look at a million things on the way!). He walked up to the daycare where the woman looking after him was waiting and lovingly greeted him. He let her help him out of the jacket and went to go play with a toy. He looked around when I said goodbye, but did not seem to mind me leaving at all. I am sure this little tip of yours made the miracle happen! @Anne-Mette: Yea! I'm so glad it helped. That sounds like a lovely transition for him. I hope it continues to go well for you both. Thank you for this idea, we'll try it too! My lo is 15 months and only recently walking but I hadn't even thought of this... Worth a try for sure!